Next up is a position at the other place, as Research Associate at the MRC Cognition and Brain Sciences Unit in the group of Dr. Duncan Astle. To be perfectly honest, I actually already started there in October 2017, and things are going really well! See the MRC CBU website for more info. Obligatory hand-in photo at the Examination Schools. The past four years can be euphemistically characterised as eventful, and seem to have been ruled by two universal laws of nature: Those described by Murphy (“Everything that can go wrong will go wrong”) and Hofstadter (“It always takes longer than you expect, even when you take into account Hofstadter’s law”). Apparently, this is the typical process for PhD students. 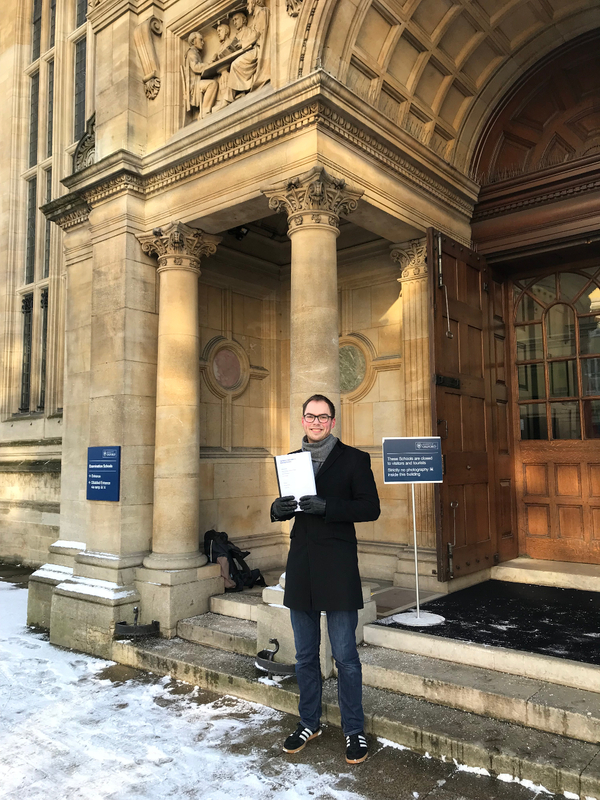 For me, this process included many and more null results, several changes of thesis topic, testicular cancer, the death of our grant’s PI Glyn Humphreys, and the immediate closing of Oxford’s Experimental Psychology building. Despite the adversity, it was – without a doubt – the best time of my life. Although I rarely have problems starting new things on my own, this thesis would never have been finished if it wasn’t for the help of many others. First and foremost, I am indebted to Masud, who took the risk of hiring me. Thank you for all your sage advice (even if I didn’t always take it), for your faith in me, and for all your support. I owe further thanks to the amazing original group (OG) of people who made the lab a warm and welcoming environment when I joined in November 2013, as a (not so very) humble MSc student. Laura (LORAH! ), we survived several offices without windows and our PhDs together; you were a great support throughout my time in Oxford, and I hope a friend for life. Kinan, I loved talking about crazy brilliant business ideas, and hope we get to actually start Dr2 at some point. Matt, you taught me my first bit of computational modelling, but more importantly you were a friend from the start. Sanjay, I learned so much from you, and your comment that I’d “make a great dictator” is perhaps the best compliment I’ve ever received. Nahid, you’re a brilliant scientist, and an amazing person; I’ll never forget your and your mother’s kindness. Trevor, you kept lab outings classy, and your work ethos was an inspiration (as was your ability to drink flaming shots seemingly unaffected). Thanks for making me feel at home from the start. Quite a few people have joined the lab since, and you were just as important for making the lab a great place. Matt Nour (a.k.a. nr 2), thanks for the discussions on working memory. Kathrin, it was an honour to be your first friend in Oxford, and I hope we’ll remain friends throughout our careers. Campbell, thanks for making me almost understand cricket, and for being a great office buddy. Yuen, I’ll miss seeing you watch Shin Chan in the office, and look forward to seeing you at the first four skins reunion. Annie, you’re one of the nicest people I’ve ever met (and I’m secretly in love with your husband). Annika, thanks for your friendship and for giving me the worst hangover of my life (and I’m secretly in love with your boyfriend too). Liv, thanks for your friendship, and for making me look slightly better by travelling even more than I did these past few years. Amelia, you’re an incredibly kind person. Sean, “lover, poet, warrior”, thanks for all the great scientific and completely unscientific talks; I’m going to miss you buddy. Pat, I’m really impressed with your success, and please keep posting pictures of Softmax. Zargol, thanks for always being so cheerful and enthusiastic. Ellie, I had a blast at outreach events. Dan, I’m so impressed with how you combined starting a family and your job. Raquel, it’s amazing how many facets there are to you: amazingly friendly and polite, but with some unexpected business ideas (please let me know when the prototypes are ready for testing). Tanja, you kept coming back to Oxford, and each time Oxford was better for it. Lisa, you were the youngest and newest, but you fit in so well! Youssuf, you came in as I left, but I enjoyed our short period of overlap. Claire, Gemma, and Rosyl, thanks for being my productive worker bees; you’re all headed towards great careers. Thank you all for making the Husain lab the best lab ever. As for my ‘other lab’, Eelke, Freek, Dante, Frida, Janina, Lev, MaryAnn, Michael, Nick, Paul, new Sam, Sofia, and Mark: Thanks for accepting me within your ranks. I thoroughly enjoyed the inspirational Stokes Lab meetings (beer-in-hand presenting! ), learned so much from your EEG tutoring and discussions, and of course the barbecues and many Uni Club drinks. There are more people in Experimental Psychology that made these past years great: The INDIREA crew of Alex (great catchups during my croquet and your allotment gardening), Eli (this thesis would NOT have been here without you), Iske (thanks for being a wonderful addition to the Husain lab, and for your great advice), Nir (already missing your monologues and our discussions on science and Jewish history), Rachel (thanks for being a friend throughout our PhDs; our Copenhagen trip was a highlight); my office mate Sam (greatly enjoyed our rants on students and stats); Glyn’s old lab members Charu (may birds stay out of your way forever! ), Florence (loved running the Wolfson bar with you), Nele (great job on continuing Glyn’s important work), Nomi (will miss our random encounters and film nights); our inspiring new HoD Kia Nobre (thank you so much for writing all those recommendation letters). Additional thanks to all other members of our wonderful department: I don’t have the space to mention you all by name, but rest assured that I won’t easily forget you. There are many international colleagues who greatly contributed to my PhD experience, but I can only mention a few here. Copenhagen felt like a second home thanks to Bart, Katsumi, and especially Chiron (daytime drinking just isn’t the same without you). Lund felt like a third home thanks to Diederick, Kenneth, and Ignace. The INDIREA project was full of wonderful people that I haven’t mentioned yet, but who did make our many meetings so very good: fellow kids Aurore, Adrian, Adriana, João, Kata, Méadhbh, and Natan, as well as responsible adults Anders, Iris, Signe, and all the others. Sebastiaan, I learned so much about open science and Python from you. Thank you collaborators (Chris, Ignace, Jeroen, Manon, Paresh, Sophie, Susan, Sylco, Teuni, and especially Stefan). And last but definitely nowhere near least: Thank you Jim and Tim, for sharing PhD misery and success, random nonsense, and incredibly offensive jokes (let’s hope WhatsApp never has a data breach). I owe my friends and family for keeping me sane (at times) and happy. Thanks opa and oma; mum and dad; and Elmer (you might be doing a real science, but I finished my PhD in fewer years than you did your undergrad, BOOM!). Thank you Kiki (and family), Joram, and Layla. Thank you Josh, for being a special friend for life. Thank you further members of Wolfson’s best-ever croquet team Sarah, Yasser, and Niels. Thank you other Wolfson neighbours Erminia, Alicia, and Joshua. Thank you Jacob, for making me almost a half-decent chess player. You’re all amazing people. Finally, and perhaps most importantly, thank you Asphodel, for being there while I was writing this thesis, for always believing in me, and for moving to a new city with me. P.S. In the most embarrassing and unfortunate event that I forgot to name you here despite your important contribution to my DPhil: Please accept my apologies, remember how awful my memory is at times, and know you have my gratitude. Also, you’re entitled to one free drink on me, to be cashed in whenever you feel like it. As someone who is delving into eyetracking and cognitive science for her MS thesis, this website has been a very soothing resource to fall back on. Congratulations and I wish you more success in life.